I don't think there will ever be a show like this again. I must have watched all the episodes 6, 7 times. Frasier always cheers me up. The show and characters are so likeable and... actually I cannot find quite the the right word, but the show has a magic that for me other shows do not have. It makes me feel the world is not such a bad place. 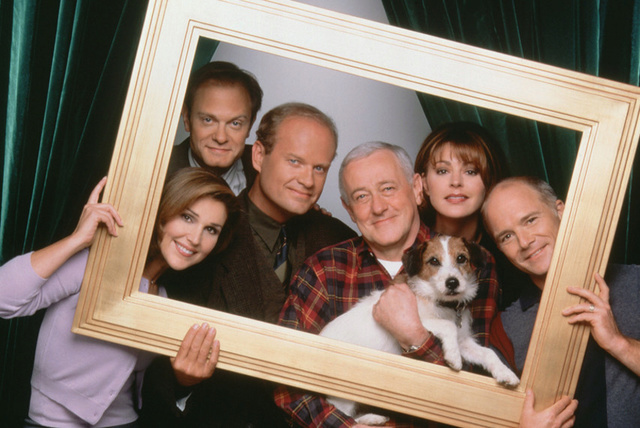 One thing I noticed: I started watching Frasier around the time when the last 3 seasons were being aired and I remember thinking at the time that the last couple of seasons were awful compared to what came before. I think the reason is that I watched those seasons "live", once a week or however often they aired. When you watch one a day or so, it's a much better experience, and I now think that season 11 is pretty great. I would still maintain that season 10 is below par, but it doesn't matter. The best seasons I think are those in the middle of the first half. I am very glad the show wasn't cancelled in season 1. The series in my view really took off with "My Coffee with Niles" at the end of the first season - fantastic episode. The episode that really epitomises Frasier for me however, and I don't really know why, is the Halloween episode in season 5. The merry intermingling of the extended list of fantastic characters must have something to do with it. Thank you for the forum and for keeping the legend alive. Welcome to the forum! I have all the DVDs, but I still have a series link set up to record the episodes on TV so I have quick access to them while I have my breakfast. It's amazing how long ago it ended, yet I still re-watch them over and over again. There is always a sadness when things end. When I was young I thought Flamborough was the end of the world. While it could have gone on further, the second Eddie was born in 1995 and if he is like Moose, he would only have done 10 years - only 1 extra after Season 11. Enzo died on my 14th Birthday, aged 14. Plus, I felt a slight decline in the scripts towards the end, and I'm not sure how long they could keep making it funny. Imagine an unfunny episode of Frasier? I've only ever seen the last episode once. I can't watch it again...maybe someday and maybe in the right company. Too much to think about. I actually inadvertently watched the last episode shortly after it aired, when I was just getting into Frasier. I didn't realize at the time that it was the finale. Since then, I learned what it was, and have never rewatched it (and I've never seen the first part of the finale). I think I'd be too bummed, and besides, it's nice always having "new" Frasier to come back to in that penultimate episode.